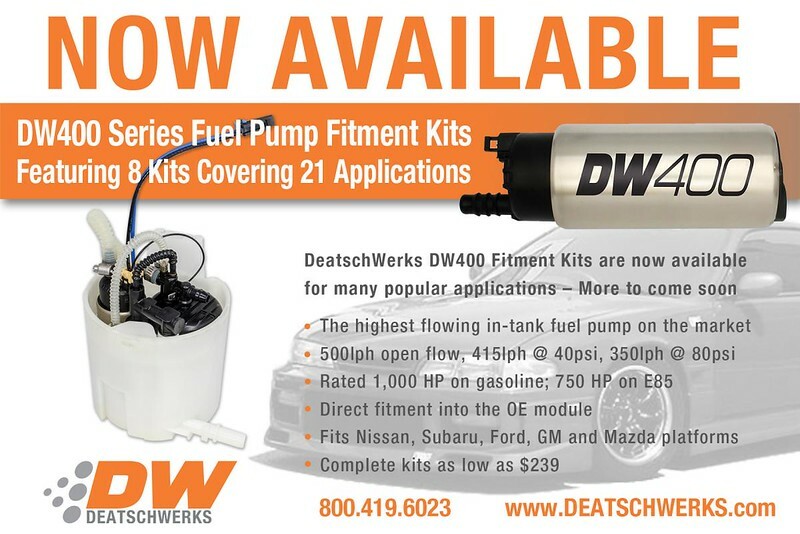 With over 125 unique fuel pump fitment kits covering hundreds of different applications, DeatschWerks (DW) is the leader in drop-in fitment fuel pump solutions. DeatschWerks is building on this reputation by announcing the release of nine new fuel pump fitment kits for the 415LPH DW400 fuel pump. These new kits allow drop-in fitment into 21 popular applications including the 2011-2017 Ford Mustang 5.0L Coyote. DW will release a second round of application-specific DW400 kits later this year. 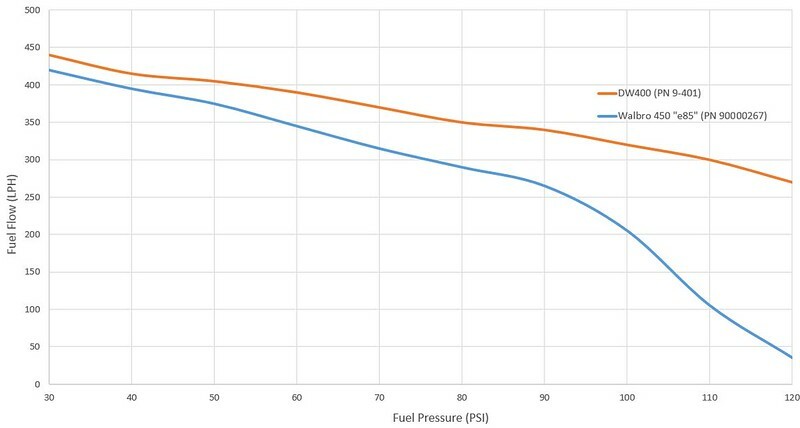 In-tank is the ideal placement for high-performance fuel pumps; they are more reliable, less complicated, quieter, and more cost-effective than in any other location. The limiting factor has always been flow restrictions. 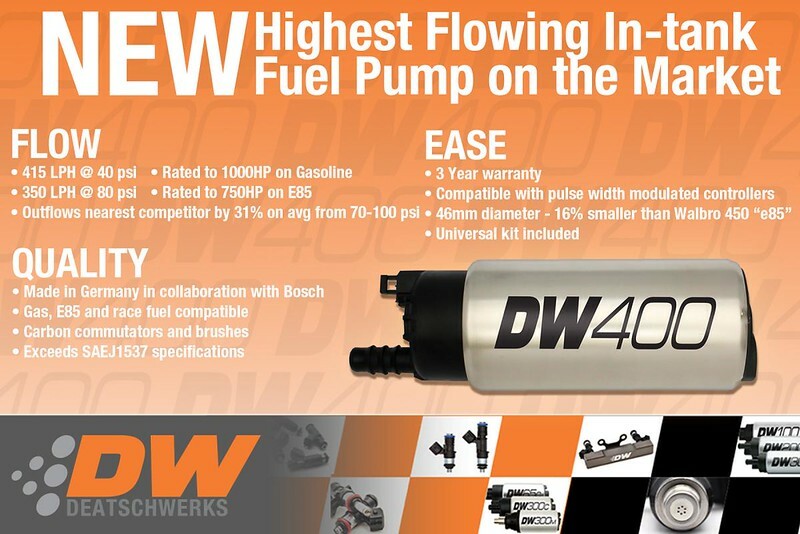 At 415LPH, the DW400 is the highest flowing in-tank pump on the market and will support 1000hp (gas) and 750hp (e85). The release of the new fitment kits will make getting this pump into your tank easier than ever before. Furthermore, as a direct replacement for the OE pump the user can retain all the benefits of the OE fuel system including excellent low fuel level pick up, pump programmability through the OE pump controller, and retainment of all OE fuel lines. More information about the new DW400 fitment kits can be found here. DeatschWerks (DW) is a manufacturer of premium aftermarket performance fuel system components. DW offers a comprehensive line of fueling components including injectors, pumps, regulators, filters, rails, lines, and fittings. DW focuses on innovation and quality to deliver fueling solutions that fit the customers’ needs.